Giving the MPs a receipt for their expenses claim. 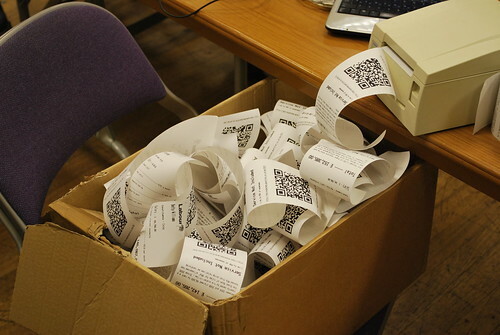 Talking one night about printing with receipt printers, Dave Challis said that it would be interesting to print out a receipt for the MPs expenses the next day. We grabbed the google spreadsheet that contained the results of the Guardian’s crowd-sourced data, parsed it up using python and then spent an hour or so adjusting the look and feel of the receipt itself before starting the print run. 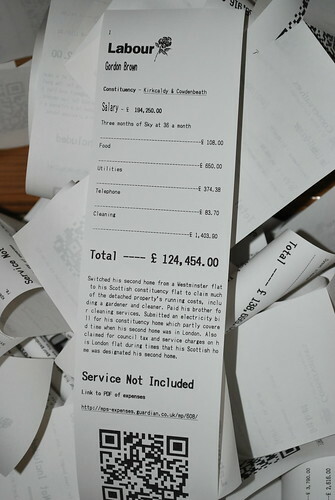 There is nothing quite like seeing an over-spilling box of receipts to help you understand how many MPs there are, how many claimed well over a hundred thousand pounds on top of their salaries and how many claimed for Sky-Sports. 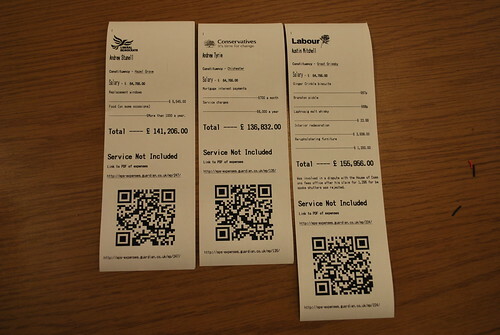 The receipt itself contains the notable information about the MP, some sample claims listed as if it were a fake bill and the sum total their have claimed over the period (2007-9 IIRC) At the bottom of each receipt is a url link (and equivalent QR code) taking you to the Guardian site where they hold the PDFs of all the receipts so if you have the time, you can verify it yourself. 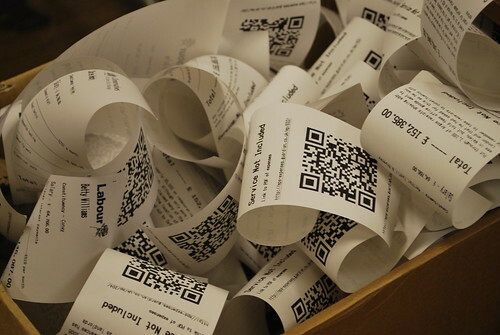 Any chance we can get a scan of Tom Levitt’s receipt for out site? That’d be a great way to finish it with one last post!